Take one of Europe's most stylish royal women, and add a serious collection of heirloom diamonds, and you know you've got our top royal jewel moment of the year! 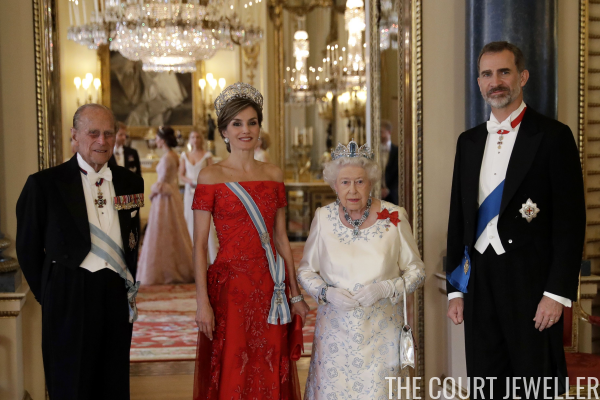 Three years after her husband became King of Spain, Queen Letizia finally began wearing the Joyas de Pasar, a collection of jewels designated for the use of the nation's queens. In February, Letizia made her public debut in La Buena, Queen Ena's grand wedding tiara, during a state visit from Argentina. She also wore the earrings and bracelets from the joyas collection. Letizia also wore the grand jewels during the state visit to the United Kingdom in July. The bracelets from the suite have become particular favorites of Letizia, who sometimes wears both stacked on one wrist. She's been wearing more fabulous jewels from her mother-in-law, Queen Sofia, as well, and jewels that belonged to her husband's grandmother, the Countess of Barcelona. Here's to more jewels from Letizia in 2018!